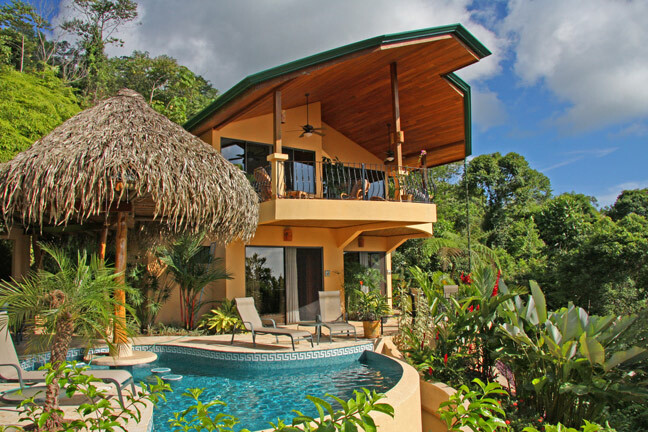 Located in the hills of Escaleras on the Southern Pacific Coast of Costa Rica in one of the few places on earth where you can experience the lush mountain ridges of the rainforest as they meet the ocean. The amazing & unique proximity of the ocean to our hillside provides the true opportunity to experience the sound of the ocean waves, in between the sights & sounds of a true jungle. It is not uncommon to find Toucans or parrots in the trees; or monkeys, moving through on their way up the valley to higher ground. Escaleras is well occupied by many upscale homes – but you’d never know they were there! It is conveniently located just above the small fishing village of Dominicalito; minutes from the town of Dominical, well known for its surfing and deep sea fishing. Not yet truly “commercialized” here you are still able to experience the Costa Rican culture and have the chance to meet some of the friendliest & happiest people in the world. Our Villas are a 7 minute drive up a well maintained gravel road from the highway turn off. You actually will drive through a creek just before you head up the hill. Thus, please ensure you have rented a 4x4; somewhat of a precaution but, depending on the weather (rain) four wheel drive is necessary.